Walks, talks, films, music and drama were all on the programme for this year�s Crieff and Strathearn Drovers� Tryst. 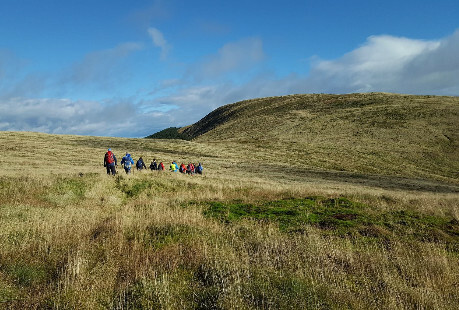 Despite two of the higher walks having to be cancelled due to weather, during the week over 300 people enjoyed the 33 walks that were on offer and around 150 people of all ages enjoyed a day of Mountain Biking at The Hairy Coo at Comrie Croft on Sunday 8th October. The finale was the ceilidh held in the Strathearn Artspace on Saturday 14th October, when around 50 people danced the night away to the excellent Chitterybite Ceilidh Band. Well over half the walks were sold out, a testimony to the enduring popularity of the Tryst, and there was also a varied programme of talks, films, music nights and drama, all put on by local businesses and organisations. Organisers paid tribute to the �fantastic team� of around 40 unpaid volunteers, and the support from local businesses, media and Bid Crieff. A provisional date for next year�s Tryst has been set, with events to run from Saturday 6th October to Saturday 13th October 2018.